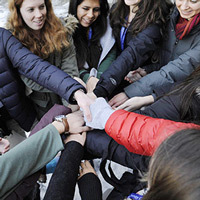 Webster Geneva welcomed new students from around the world for spring orientation. Webster Geneva's Spring New Student Orientation welcomed 77 new students from all over the world to the campus in Bellevue, Switzerland, including 50 through the Webster International Network Schools program. Students called the first week "absolutely unreal. It's amazing to be surrounded by people from all over the world and exposed to so many different cultures and languages," said Kate Foster, a student studying abroad from University of Massachusetts - Amherst. In addition to students arriving through the WINS program, 14 new Webster degree-seeking undergraduate students arrived from Pakistan, the Philippines, Greece, Switzerland, Lebanon, Germany, France, Brazil, Serbia, Croatia and the United States, along with 13 new graduate students from Egypt, France, Kuwait, Romania, Russia, Serbia, Switzerland, the United Kingdom and the United States. Together they found a truly welcoming and stimulating environment. Spring New Student Orientation at Webster Geneva brought 77 new students from around the world to campus (pictured at left) and for a trip to nearby Chamonix in the French Alps. "My arrival to Webster University has been nothing but welcoming," said Jelena Debelnogich, who arrived from WINS partner Kent State University. "The student leaders during orientation helped me acclimate to my surroundings." "I was really impressed to see the great work done by the student leaders, which is inspiring me to join them too," said Zain Abbas, a Webster undergraduate student from Pakistan. Read more of the students' thoughts in this story at Webster Geneva, and see more sights from campus and their trip to Chamonix in this Webster Geneva Facebook post.